* This post was originally posted on May 9, 2016, and has been updated for accuracy. Greetings from the Customer Service Team! Given the nature of most Customer Service departments, they are typically the first line of communication you will have with any given company. Here at cPanel, things are not much different. Being that we have the opportunity to connect with such a wide and diverse range of cPanel users, we pay close attention to trends in requests that we receive. One such request we receive from time to time: Can I install cPanel & WHM on Google Compute Engine? Today we are going to look at some of the basic steps you will need to take in Google Compute Engine to get yourself ready to install cPanel & WHM. First, you will need to register an account with Google Compute Engine and can do so here. Currently, Google offers a free 365-day trial which we will gladly be taking advantage of for this installation. If you have an existing Google account, Compute Engine can be associated with this. 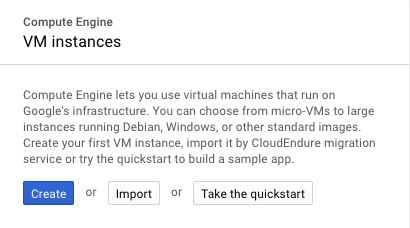 After you have created your Google Compute Engine account, you will be presented with a popup that will direct you to create your first VM instance. After clicking “Create” you will be brought to the configuration page where you will create your VM instance. For this installation, we will be using CentOS 7. From the cPanel & WHM System Requirements, we know that CentOS 7 will require at least 1GB of RAM and a minimum of 20GB disk space. The RAM is already set to 3.75 GB, which exceeds the minimum, so we will only need to adjust the disk space and operating system before we continue. You can update the operating system and disk space by clicking “Change” in the Boot Disk section. 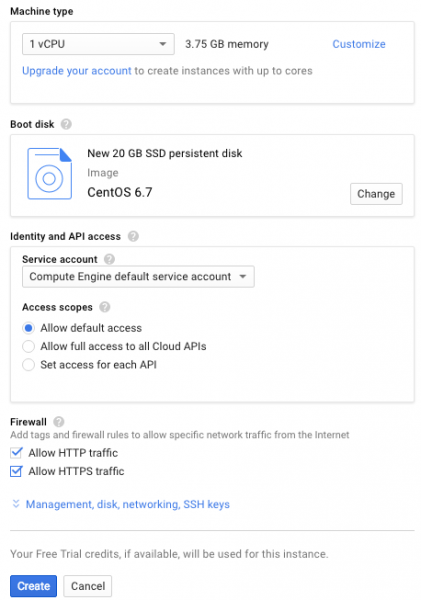 Before you continue, be sure to check the boxes under Firewall to allow HTTP and HTTPS traffic as this will be necessary for accessing the cPanel and WHM interfaces. You can now run the installation script as shown in our installation guide. Once you execute the install script, let the installer run its course. After the installation has completed, you should see instructions for accessing your WHM services. This will not ask you for the old root password, rather, register a root password of your choosing. 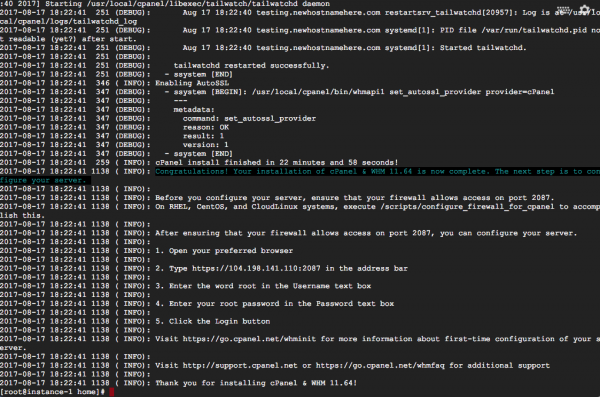 After the password has been updated, you will need to configure the firewall for your VM instance by creating firewall exceptions for each port cPanel & WHM uses. This can be done through the Google Compute Engine console. 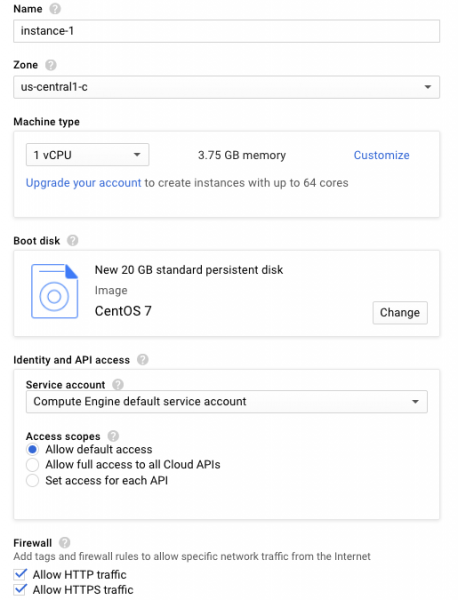 You can find more information about this interface from Google’s Virtual Private Cloud (VPC) Network Overview documentation. For reference, you can find a list of ports and protocols cPanel & WHM utilizes from our Knowledge Base here. One thing to consider when choosing Google Compute Engine is that port 25, which cPanel & WHM utilizes for SMTP, is not open. Google provides additional information for sending email in their documentation here. We hope you enjoyed these helpful tips for Google Compute Engine! Have an idea for something you’d like us to explore? Please provide feedback to cs@cpanel.net and it will be our pleasure to take your suggestions into consideration! Nathan Schmidt is a Customer Service representative and occasional guest blogger.